When I worked road patrol in the southwest quadrant of Warren, which borders Detroit's northeast side, I used to love going into this divey little restaurant called House of Reuben. It had been there for as long as I could remember. Before I had ever dreamed of becoming an officer, I used to drive past this restaurant on the way to take my kids to school. It never occurred to me to stop in the place. As I said, it was small and didn't have much curb appeal. When I started working and was assigned that area, one of the senior officers took me there and OH MY YUM!! This place had the best Reubens ever!! They also had great fish and carried smelt which made me do a happy dance. Their burgers were good. Their pastrami was out of this world. It became a regular stop for me at dinner time. They were fast, friendly and understanding when I had to leave before my order was ready and always happy to make my order fresh when I would return from whatever emergency had pulled me away. One of the problems of working the road, for me at least, was that I got very sick of eating restaurant food every day. Even good restaurant food gets old when you eat it constantly and are limited to the few restaurants available in the 9 square miles to which you are assigned. One day, I walked into the House of Reuben and none of my regular meals sounded appealing to me. They may have had the best Beef Barley Soup I had ever eaten but I was sick to death of it. I didn't want a sandwich so filled with meat and goodies that you had to eat it with a fork and knife, even though I knew said sandwich was amazing. I finally settled on a Grilled Cheese Sandwich. My partner looked at me like I was nuts...who goes into this fantastic deli and orders a grilled cheese? When the sandwich was put in front of me, I started drooling. Two thick slices of white bread stuffed with sharp cheddar cheese, bacon, tomatoes and bermuda onion grilled up to a perfect golden brown and melting out of the sides. I shot my partner a "hah" look and dug in. It was and still remains the best grilled cheese sandwich I have ever eaten. I did my best to recreate this sandwich. I omitted the bacon because it is, after all, Meatless Monday. I used Vidalia onions and a medium sharp Irish Cheddar. The bread is a regular slice Sourdough. I hope that you enjoy it as much as we did. This sandwich was made as part of an event for Holiday Fun with our Blog Friends. April is National Grilled Cheese Month so Caroline of Caroline's Cooking invited us to join her in this celebration. 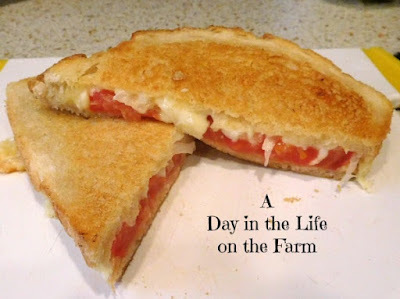 You will find many more Grilled Cheese creations following my recipe. 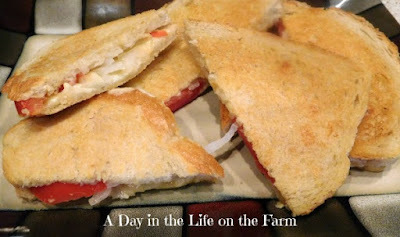 Love sourdough for grilled cheese! What a delicious looking sandwich! I love these flavors together. Thanks. The bacon really is good on this. Thanks Paula, welcome home. Hope your trip was marvelous.